Dengan lokasi mudah di Munich, Hotel Andra München adalah tempat yang hebat untuk menjelajahi bandar yang menarik ini. Dari sini, tetamu boleh menikmati akses mudah kepada semua yang bandar meriah ini boleh tawarkan. Syurga untuk berehat dan bersantai, hotel ini akan menawarkan pembaharuan penuh hanya beberapa langkah dari pelbagai daya tarikan bandar seperti Kedutaan Ukraine, Kedutaan Tunisia, Panggung Jerman. Ambil kesempatan daripada pelbagai perkhidmatan dan kemudahan yang tiada tandingan di hotel Munich ini. Pilihan kemudahan kelas atasan seperti meja penyambut tetamu 24-jam, daftar masuk/daftar keluar ekspres, layanan bilik, kemudahan mesyuarat , pusat perniagaan boleh dinikmati di hotel. Alami bilik dengan kemudahan berkualiti tinggi sepanjang anda menginap di sini. Sebahagian bilik menyediakan meja, telefon, internet tanpa wayar (caj dikenakan), televisyen, TV satelit/kabel untuk memudahkan tetamu berehat dan kembali bertenaga. Di samping itu, pihak hotel menawarkan aktiviti rekreasi untuk memastikan anda mempunyai perkara untuk dilakukan sepanjang penginapan anda. Apa juga tujuan lawatan, Hotel Andra München merupakan pilihan yang terbaik bagi penginapan anda di Munich. We enjoyed two quiet nights at the hotel and found it a quiet spot to return to after an intensive tour of eight art galleries in our two and a half days in Munich. The quiet interior courtyard is an ideal place to relax in late afternoon with beer purchased at local shops. Plenty of on street parking by the hotel was also a bonus. Our stay was very pleasant. The staff wad friendly and helpful. Conveniently located close to HBF and attractions. The breakfast buffet was fantastic! Overall good value for the money. Overall satisfactory, with the best breakfast that I had during my 10 day Europe tour. However location is a bit far from the subway station and there wasn't any air-conditioning so it feels hot during summer time. Highly recommend friends to stay there as it is full of frangance in the room and comfortable to make you fall in sleep. Toilet is clean and tidy. Buffet breakfast is gorgeous! That would be much better if brewed coffee provided. 1. Very accommodating staff especially Dennis. 2. Great breakfast. 3. Good location, 8 -10 minutes walk to Central Station, about 20 minutes walk to Mary's Square. very pleasant but a little bit put off that I have to pay 3.50 euro per account per day for Internet access. With close to 100 euro per night, you would think the Internet access should be free! This hotel is a bit far from the Main train station for a person who has to drag a 25kgs luggage to walk to but the great breakfast spread compensates this. One of the better ones which provide variety of hot food – much needed during the cold winter! The only downside, probably not entirely the hotel's fault was the Sports exhibition was held in Munich during our stay, so we were forced to pay inflated hotel prices even though we were not there for it! Hence it was not a value for money stay for us. room is little bit small and no sliper. breakfast is quite awesome and staff is very kind. but little bit far from central station. The paid wi fi is not great option nowadays. Bu it is still cheap. Th parking is cheap but located about 5-7 min walk. location is convenient, it is in the centre of the city and easily access to most of the place of interest. No need to take any transportation, in walking distance. Can get up early to visit the churches before it is getting too crowded. Hotel is also convenient for eating. Next to lots of tukish restaurant and can enjoy the turkish cusine. it is wonderful. A little bit far from the train station, but apart from that, everything is good. Great services and they offer a nice breakfast in the garden. There was no room service, towels were not changed, carpet was not vaccumed. The lady in the reception was really angry and not at all polite and helpful. Internet was paid and it didnt work. Never again. The entrance smells like rotten fruit because there is a grocerie store and storage in the same building. Do not reccommend it, there are many other hotels much better for the same price. Very good breakfast. Close to central station (hbf). Many supermarkets close by. We stayed three nights there in July. It's very close to the station and very easy to find. Spacious room and smile staffs. A little noisy in the morning. polite services, very good breakfast (good variety between the days). short walk to Munich central station. modern rooms. plenty of space. great breakfast selection. very helpful staff. 5 min walk to munich central station. parking available on street. Hotel Andra is very conveniently located near the central train station. The hotel is well located within 5 mins walking distance from the central train station. The front desk staff are very helpful to ensure we hv a good stay at the hotel. The rooms are well maintained and the breakfast spread is great. Definately value for money and would recommend my friends to stay there . 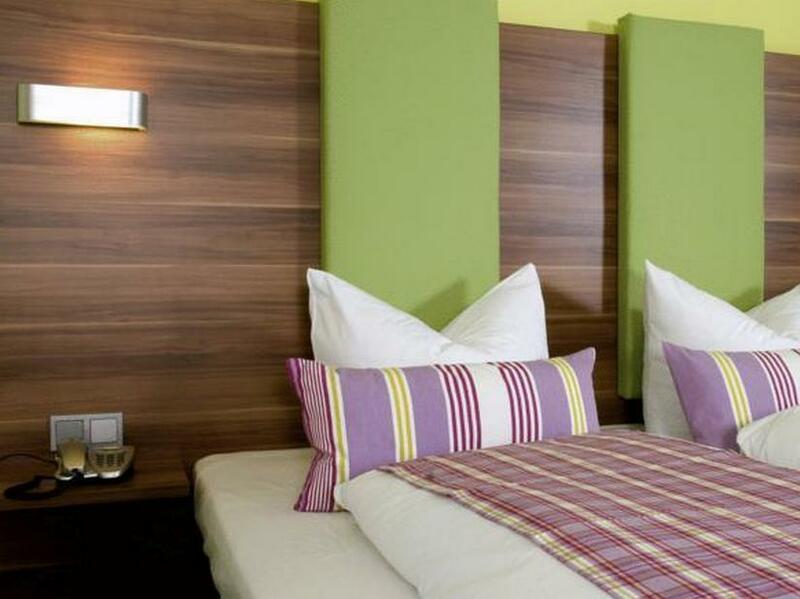 This hotel is close to the central station, many restaurants and shops. The hotel is very clean, friendly & professional staff with large rooms for families. Perfect for our one night stay over in Munich. A few blocks from the train station and a nice walk to city centre. Clean rooms and the best breakfast spread I have ever seen in a European "breakfast included" package. The neighbourhood is a little unique with it's blend of cultures but felt safe. The staff was friendly and very helpful. There is no hot water for the first day. And I located next to the roof that the window could not open.